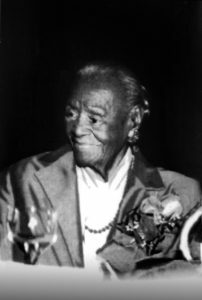 She escorted high school and college students to Atlantic City in the 1940s for employment opportunities so they could gain work experience and money needed to fund their education. In the 1950s she launched the first job clinic/job fair for students, which later became known as Career Day. In the 1960s she established the Carlotta Stewart Scholarship Fund to help deserving students. Carlotta played a significant role in the fundraising to purchase the first site for a branch YWCA in 1942 as well as the second site in 1962. She has served the YWCA in a variety of leadership positions. She also founded the first Basileus of Alpha Eta Zeta chapter of Zeta Phi Beta sorority in 1939. She later helped open the organization’s Stork’s Nest Center, a project with the March of Dimes Birth Defects Foundation seeking to provide assistance to women and their babies. Her volunteerism also extends to working at WDIA, helping to link community members with agencies to meet their needs, and playing the role of “Aunt Carrie,” giving advice to young people. She is an active member of Mt. Pisgah CME Church where the fellowship hall is named for her. For the past 15 years, she has read newspapers and books on Memphis Public Library radio. In February 1999, she received the first Comforter Award from the Tennessee Black Heritage Celebration for a person who embodies dedication to the uplifting of the minds and spirit of young people. Carlotta is 104 this year and continues to attend community events.